Eggs! Eggs. Eight or Nine eggs each day. It’s the two-sided coin of owning 11 chickens. On one side, I’m thrilled to have fresh eggs always available. On the other, the stream of eggs is so steady at this time of the year, you can be swimming in them in no time. My kids do all of the fetching. A “chore” that isn’t much like one at all for them. They even know the sounds that come from the coop that tell them there will soon be another egg to collect. They watch, they wait. They sometimes fight over who “just got to check! !” But, they keep bringing them in, and it’s my job (that I love) as the cook to find things to make out of them. After scrambled, fried, baked, en cocotte, hard-boiled, and poached (although I haven’t completely mastered that one yet) I decided to use them in a less obviously eggy way. Yes, my children’s “eggs? again?” looks factored greatly into this decision. Truthfully, even though I’m an egg lover, I’ve begun to feel that way too, so it was time to find something new. I decided to try Thomas Keller’s 7 yolk pasta. I tried it mostly because it uses 7 eggs, but also because, having Italian roots, I felt like I needed to experience making pasta by hand at least once. And, could Thomas Keller, seemingly the most fastidious person alive, put out a recipe that didn’t work? Probably not. As it’s written in the French Laundry Cookbook, you make this dough entirely by hand, starting with an egg filled flour volcano on your kitchen counter. It’s pretty exciting! You swirl and swirl the egg mixture, picking up flour gradually as you swirl, and then once it all comes together, you knead it for what seems like a lifetime, but really is about 20 minutes. I broke a sweat, my shoulders were burning, but I had a golden ball of silken dough! I wanted to set it on a shelf and sit back and admire the result of all that chicken/human labor. And I did for about 30 minutes (the time you let it rest after kneading), but then I came to my senses and remembered I was on the practical mission of dinner and got back to work. I didn’t have a pasta machine, but I had read accounts of grandmothers using broom handles to roll out the dough in order to get it as thin as it needs to be, so I just went with that. 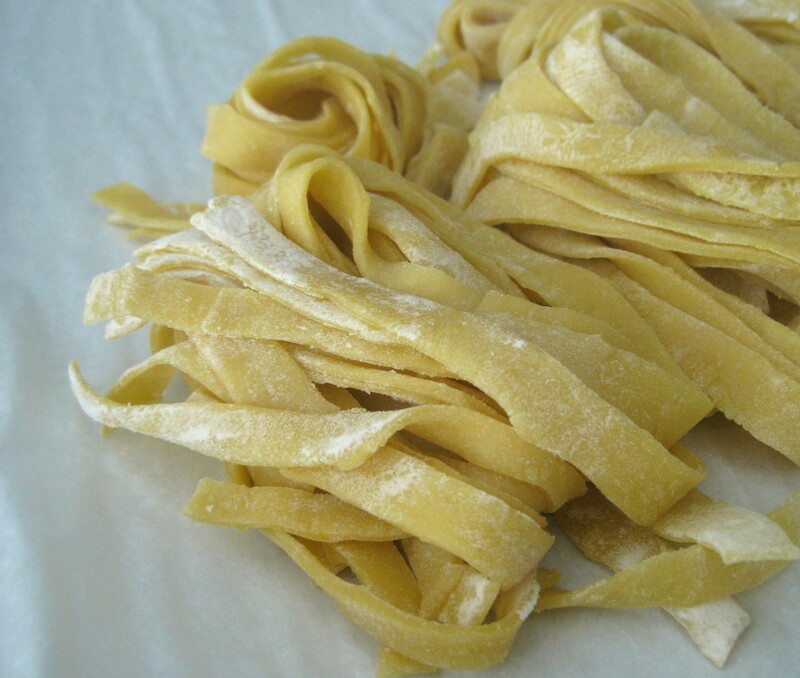 There are tons of You Tube how-to’s on rolling out and cutting pasta by hand (this is how I did the cutting). The people in the videos usually have long rollers (see a gorgeous example of one here), but know that you can use a wooden broom handle and it all comes out very well with delicious bowls of pasta and not an “eggs, again?” look to be found. 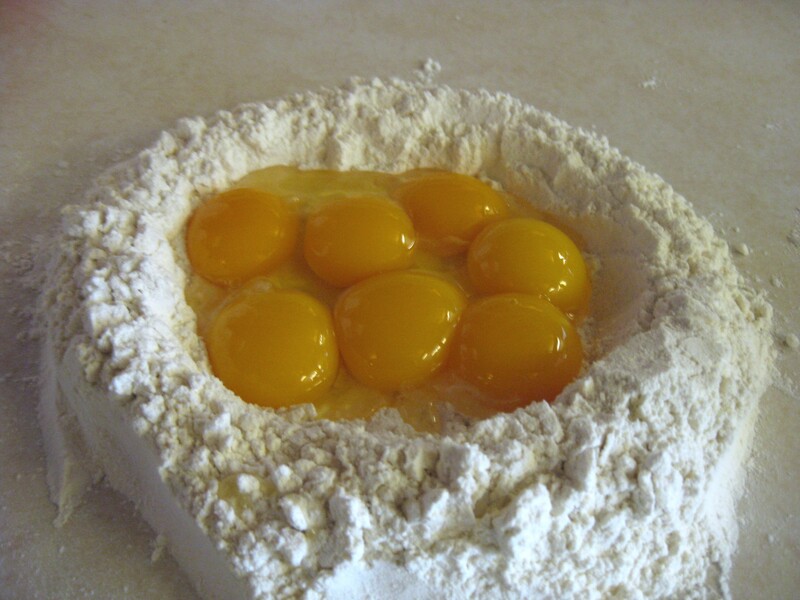 ::This pasta would be great to use in this, or, if you are still craving more eggs, this. ::Use the leftover egg whites for this. No one will know. thanks Monica! we have chickens too and I just realized today that I have 4 dozen in the fridge!! and i’m so tired of making scrambled eggs. so now i know what i’m making this weeknend! I don’t think I knew you had chickens! :) You’ll like this, but you may want to scale the recipe up to feed all your people! It’s so funny. The whole time I was making this I was thinking about hand mixing concrete in Nicaragua b/c it’s exactly the same process! we have failed to master the volcano……and not for lack of trying. we finally caved and pulled out the processor. yum! a good substitute and FAST! Glad it tasted good! You are currently reading The Egg Challenge at Space & Thyme.